To fulfill our mission and for HR to effectively manage these processes, we needed to provide real-time information about events and interactions occurring within our system and with external systems. And that’s exactly what we did in the August release! 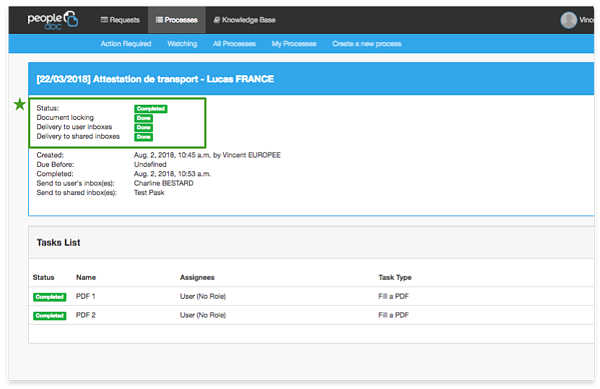 As part of our ongoing effort to provide greater visibility into the status of processes, we have added some exciting features to the August release! It’s now easier for users to see when a process is published and ready to be completed due to automatic process status updates. Also in this month’s release is a new way to manage a process with errors. A new status, “Publishing”, will appear after you click “Publish”. A process with errors, like an assignation problem, will not be published - allowing for HR to take quick, corrective measures. These updates make sure there are no breakdowns in a process, ensuring that employees are receiving great service from HR. The beauty of Process Automation is that it connects not only all of the PeopleDoc modules, but also with external systems. With Process Automation, HR can trigger events and interactions in PeopleDoc and with the external systems and track the status of these interactions in one place. Over the last few releases, we have added new information to show the status of these three events in a process. If something goes wrong during one of these last three events, we will alert the HR user with details of the process so they can quickly take action and make sure the process runs efficiently. In this release, we have added new information concerning sending to shared inboxes in the process details: Delivery to shared inboxes. If the sealing of the document and/or sending it to the user inboxes can’t be done, we do not launch the sending to shared inboxes - allowing HR to intervene and review the process. By having process status information in real-time, HR professionals are further equipped with the tools they need to ensure they are working efficiently, while enhancing the employee experience.